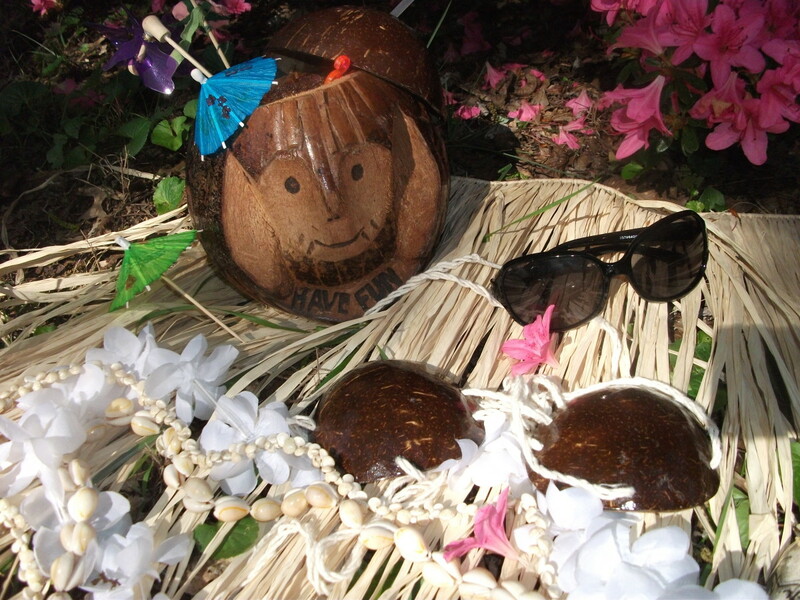 A few Hawaiian party decorating essentials. 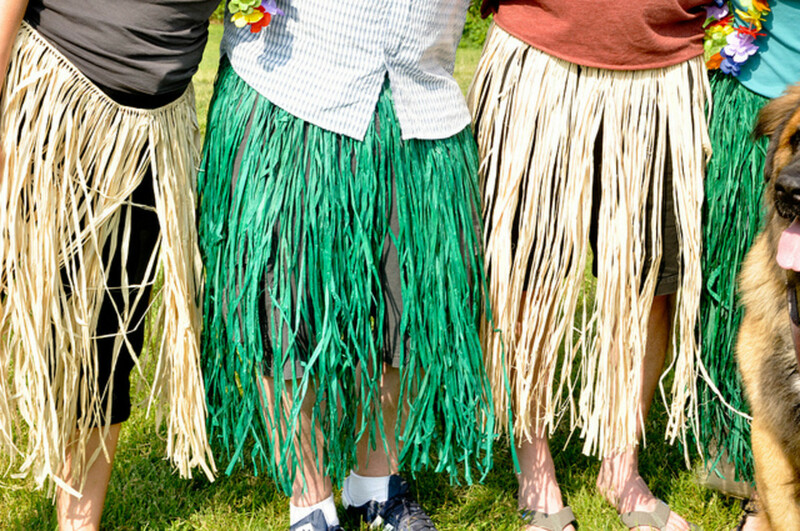 Luaus and Hawaiian themed parties are one of the most popular types of parties and for great reasons, too. They are perfect for birthdays, pool parties, weddings, anniversaries, or just summer get-togethers and cookouts. 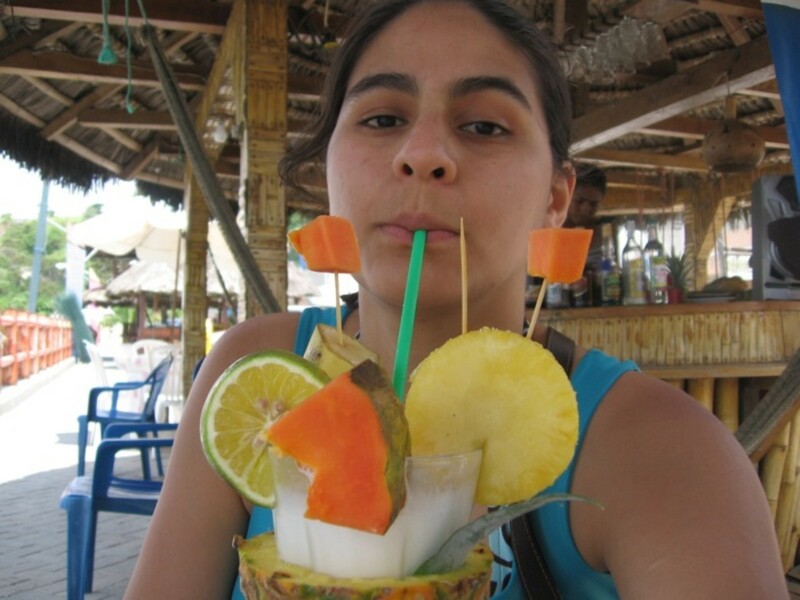 Many people even like luaus in the winter to warm up the cold months. Set an aloha spirit for your party with these great luau tips and ideas for adult and family friendly parties. You'll find decorating and costume ideas, food and drink suggestions, party games, and music. Plus, learn how to make a volcano cake and smoking party drinks. 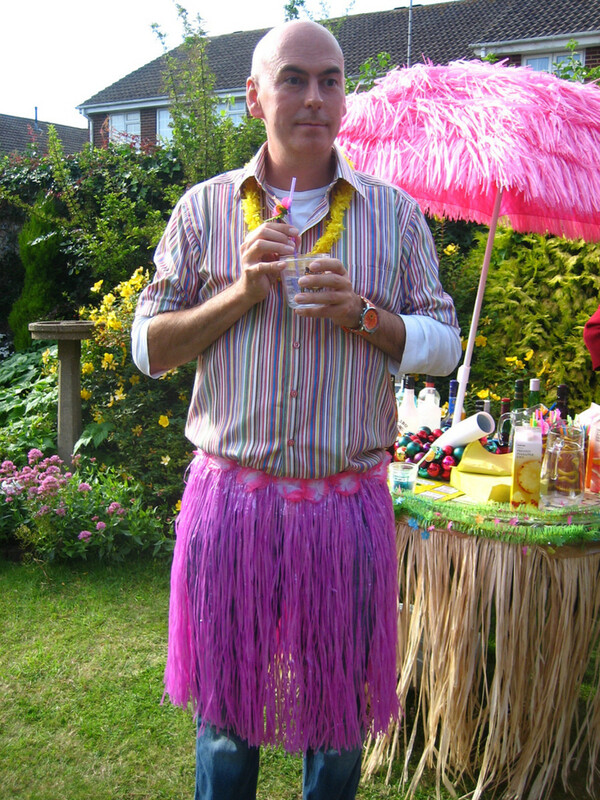 So put on your grass skirt, light the tiki torches, and get ready for a fabulous Hawaiian party. 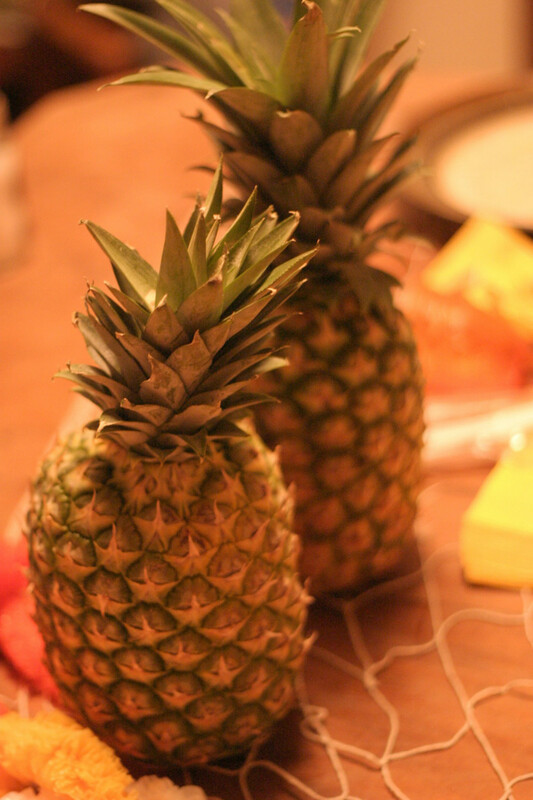 Decorations: Ideas and items that create a Hawaiian atmosphere for your party. Costumes: Have your guests dress up with these suggested items. Party Food: Both main and side dishes that work well for Hawaiian parties. Hawaiian Drinks: No party is complete without themed drinks. Dessert Ideas: Guests will love these tropical island desserts. 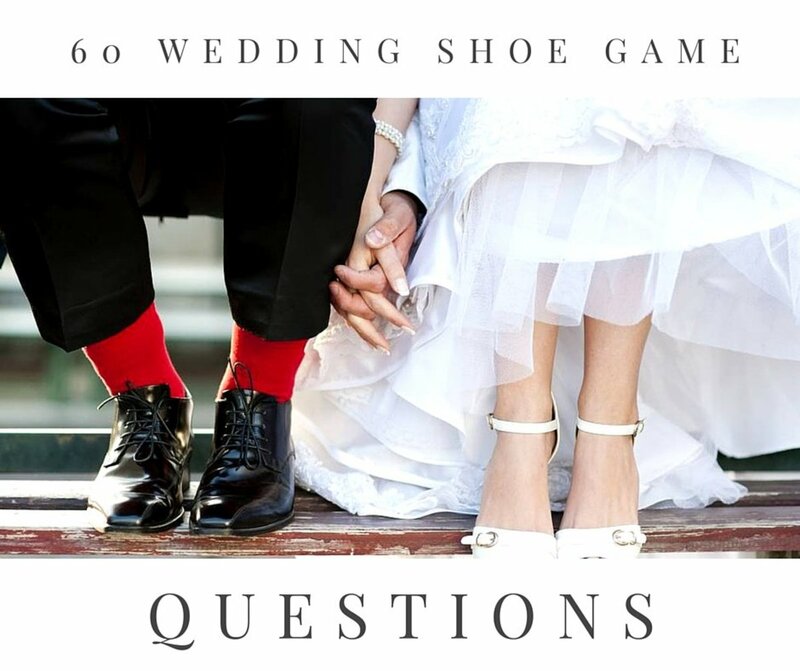 Games: Keep your guests busy with fun family games. Entertainment: Guests can learn about traditional Hawaiian entertainment. Music: Bring the island sound to your backyard Hawaiian celebrations. Think tropical beach when you are decorating for the party. Most dollar stores and party supply stores keep luau items in stock. 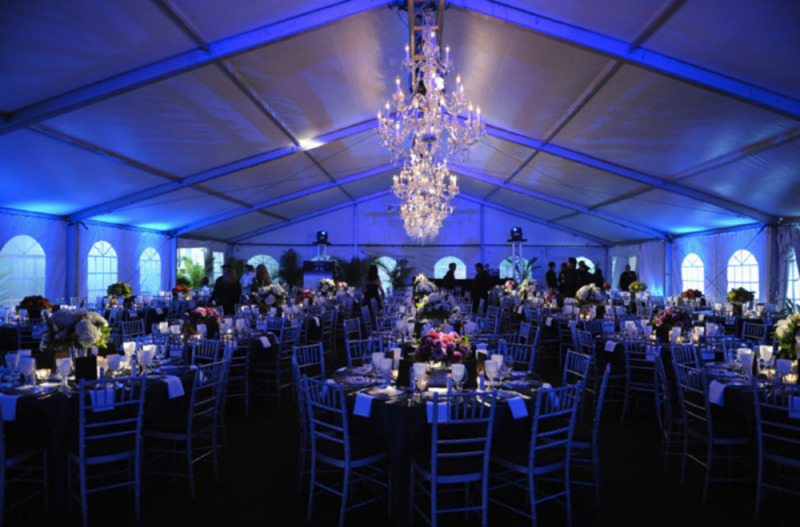 Pick a location for the party that looks the part like beside a pool or lake, or in a backyard surrounded with flowers. Volcano: Make a volcano out of clay (you could also use dirt). Place a dish in the center of the volcano then add water and red food coloring, then add dry ice to create a great smoking effect for the party. Makeshift Pool: Fill a wading pool with water. You can even add blue food coloring to the water to make it look more like a tropical lagoon. Just make sure no one gets in the pool if you do add food coloring as it may stain clothing. Makeshift Beach: Fill a wading pool with sand and add some shovels and buckets. It's a great decoration and entertainment for kids at family parties. Centerpieces: Place flowers or shells in the bottom of a clear, glass bowls and add floating candles. 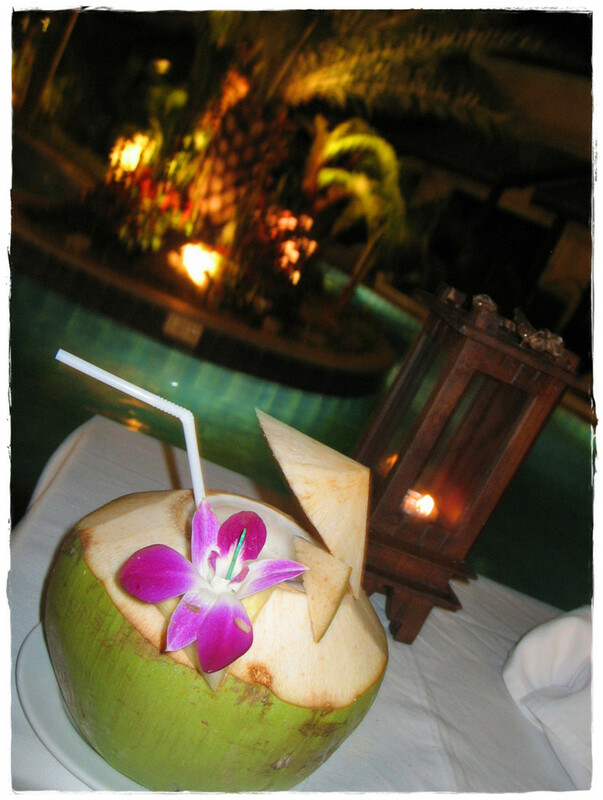 Coconuts, pineapples, and other fruits placed on tables also set the tropical scene. Part of the fun of luaus is seeing everyone dressed in Hawaiian style. Be sure to tell your guests to dress up for the party. Leis (necklace or garland made of flowers) are the one necessary item for a Hawaiian themed party. They can be worn around the neck, around the head, on the arms as bracelets, or on the legs as anklets. A flower in woman's hair is a Hawaiian tradition with a lot of meaning. Women wear them on the right side if they are single and on the left side if they are taken. Don't forget to take pictures of everyone in their costumes. You can even have a contest and award prizes to the best costumes. Give one to the funniest, the most authentic, the most creative, best couple, or best all around. 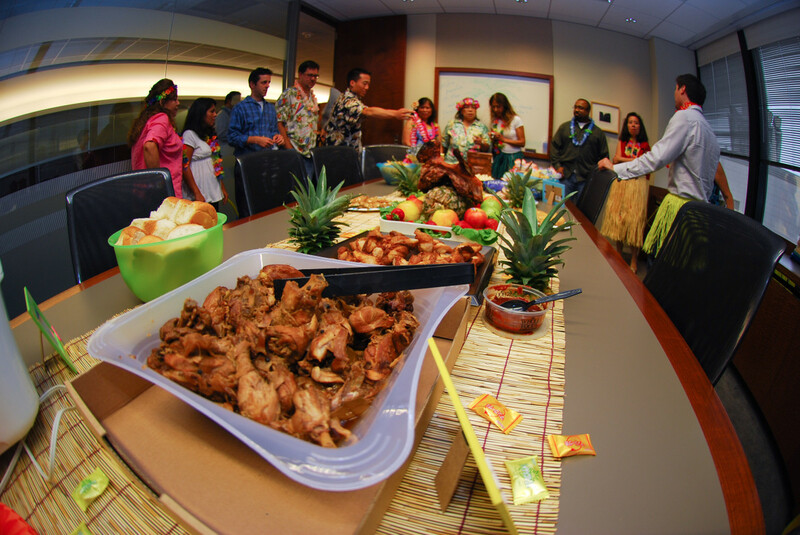 Luau means "feast," so food should be plentiful at the party. Here are some Hawaiian foods. Traditional Pig Roast: If you are feeling adventurous, you could have a pig roast over a fire pit. If that is out of your league, you could just serve pulled pork or barbeque. Fish: Salmon and other fish is another excellent main course. Grilled would be the most authentic way of cooking it. Pizza: Hawaiian pizza with ham and pineapple is an easy dish if you don't want to do much cooking. Pizza is a great choice for kid parties. Kabobs: They are great to serve for vegetarians and vegans as well. 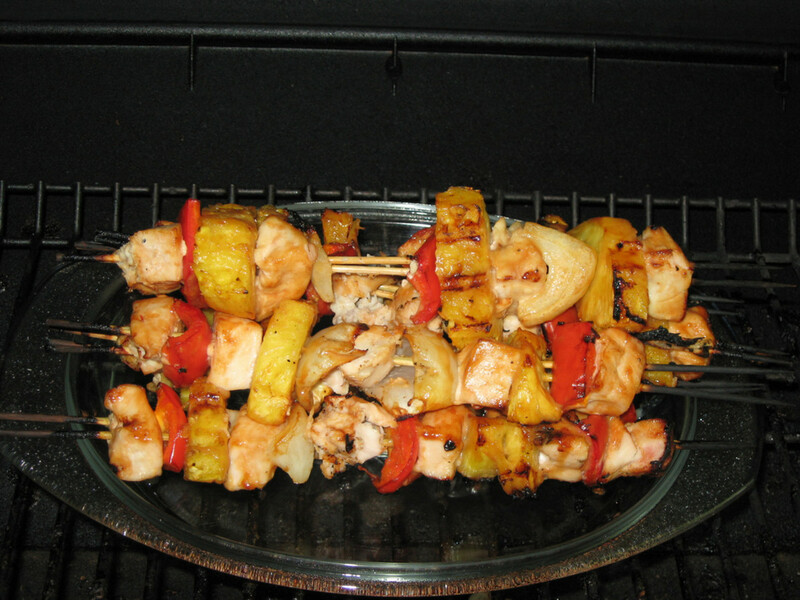 Mix up several different choices of meats like chicken, pork, and shrimp, and vegetables and fruits like peppers, onions, squash, and pineapples. Fruit: Fruit, fruit, fruit should be the food motto of a luau. 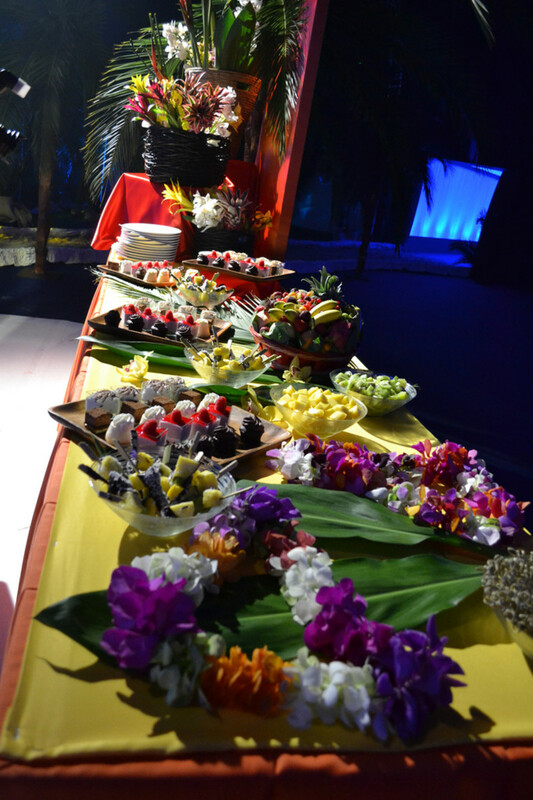 Fresh pineapple, coconut, bananas, papaya, and other tropical fruit can be served on trays. You could even make fruit salads, or put them on skewers. Nuts: Add macadamia nuts to the fruit trays or put some in bowls for guests to nibble on. Vegetables: Sweet potatoes and yams are traditional Hawaiian luau foods. You can make baked sweet potatoes for guests, or make a sweet potato casserole. Bread: Heat Hawaiian sweet rolls to serve with the meal. Traditional Poi: Poi is made from ground taro root. It is a starchy dish similar to mashed potatoes. You can buy poi online in powdered or fresh form. To make poi, you just add water until it gets to the right consistency. Most people add sugar or salt and butter to it. Poi can be an acquired taste, but most guests would enjoy tasting it. Don't forget to add the extra touches to make the party food look more appealing. You can use tropical designed toothpicks or umbrellas in the food. Pick colorful and floral-print plates and utensils. Cocktails: Serve tropical cocktails like daiquiris, Mai Tais, and piña coladas are perfect for luaus. They can be made without alcohol if your party is family or kid-oriented. Fruity drinks: Mix up a tropical punch with real fruit. Add fruit to the drinks. You can stick a slice of pineapple or citrus fruit on the side of the glasses. Or you can add small pieces of fruit in the bottom of the cup. Smoothies: Blend up fruit for smoothies. Hawaiian Coffee: Serve Kona Hawaiian coffee after dessert. Presentation: Put the drinks in coconuts or pineapples. Stick umbrellas in the drinks or use straws with flowers attached. Rim the Glasses: Use shredded coconut to rim the glasses. First glaze the edge with sugar water then dip into crushed coconut shavings. Volcano Drink: Make smoking volcano drinks by adding dry ice. Drop a few pieces into the punch bowl or use dry ice swizzle sticks to put it directly into guests' glasses. Lava Shots: Create fiery, lava drinks by serving flaming shots. Make a pineapple upside-down cake or serve a coconut cream pie. Grilled bananas are another great treat for Hawaiian parties. Open up the banana and add in chocolate chips, coconut, nuts, or whatever other toppings you want. Wrap the banana in foil and put it on a grill, or in a fire, for about 10 minutes. Another dessert idea is to make a volcano cake. There are several methods to do this. You can make a smoking volcano by putting some dry ice in the middle, or you can just have a molten cake with melted chocolate for lava, or you can mix and match the ideas to create your own volcanic masterpiece. Bake a cake with a bundt pan, or you can use angel food cake. 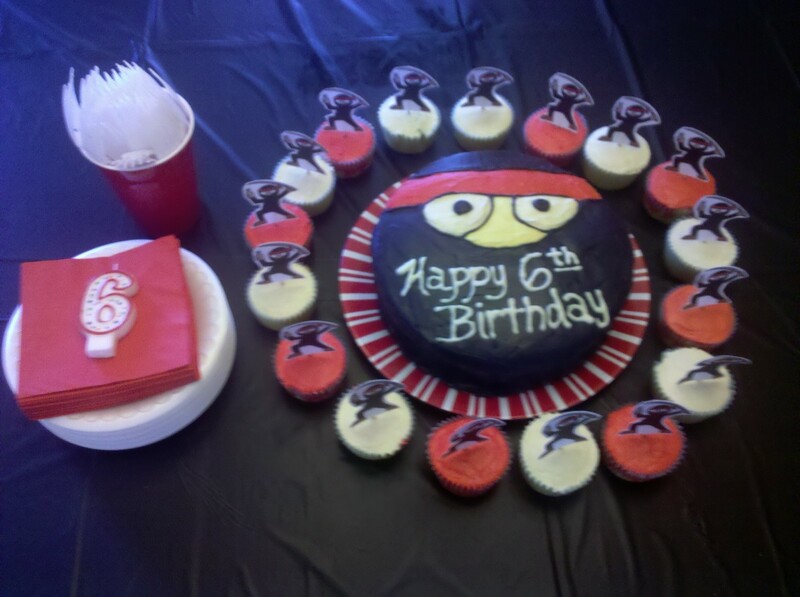 You can even use a regular cake and cut a hole out of the middle. For a taller volcano, stack two layers of cake and use icing to hold them together. Trim the cake with a knife to create the shape of a mountain. Put a cup in the middle of the cake. Ice the cake with chocolate or dark colored frosting so that the cup isn't visible. Carefully pour some warm water into the cup to help activate the dry ice. If you want bubbling red lava, you can use jello that has not set, or glazed strawberries, or another red berry compote instead of water. Make sure whatever you use isn't thick. The more liquid-like it is, the better lava it will make. Add crumbled cookies to make it look like dirt on the volcano. You can add some red frosting or glazed strawberries around the top of the dome to look like lava. When it is time to bring out the cake, add a few small pieces of dry ice to the cup to create a smoking volcano effect. If you used strawberry glaze or jello, the lava will start bubbling when the dry ice is added. Fill the cup all the way full if you want the lava to bubble over. If you don't want the smoking effect, build the cake into a volcano shape. Add strawberry or another red-colored ice cream to the middle of the cake. As the ice cream melts, it will drip down like lava. What kind of volcano cake will you make? Lava will be pouring down the sides. Ice cream lava sounds best. No volcano for me. Just a nice pie. Make sure your guests are entertained at the party. 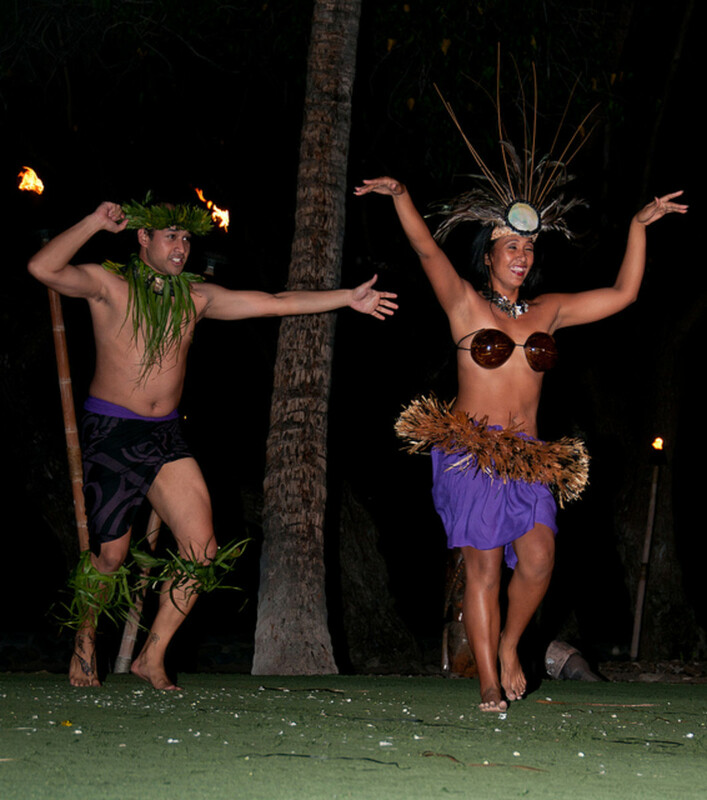 Traditionally, luau games were contests of skills or to see who was the strongest. Here are some ways to "test" which of your guests is the best warrior. 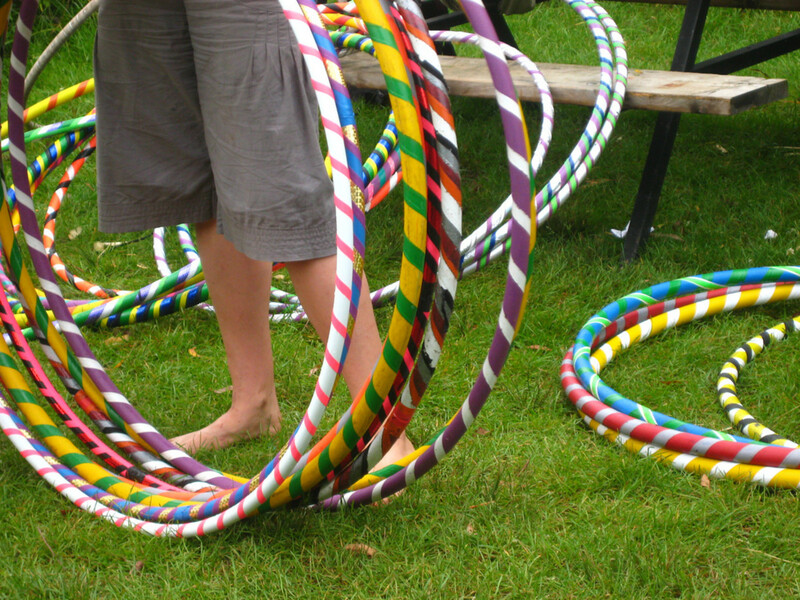 Hula Hoop Contest: Give prizes to the person who can hula hoop the longest or can keep the most hula hoops going at once. Tiki Torch Ring Toss: Stick unlit tiki torches in the ground. You can even find mini tiki torches that are only a foot or two high that would be great for this game. Then throw rings at them. Make cheap rings by cutting out the center part of paper plates. You can also find ring toys at most dollar stores. Place several torches and attach points to each. For example, the closest torch would be worth 10 points if you get a ring on it. The farthest tiki torch would be worth 50 or 100 points. Limbo: It isn't exactly Hawaiian, but it is a fun beach-party type game. Obstacle Course: Make an obstacle course race and have guests compete to see who is the fastest. Tug of War: Ancient Hawaiians played a game similar to tug of war. Get a rope and have a match of your own. Scavenger Hunt: Create a scavenger hunt that leads to a prize for the first one to get to the clues. Puzzle Race: Print off Hawaiian pictures and cut them into puzzles. Divide the group into teams and see who can complete the puzzle first. Swim Contests: If you are near water, have swimming competitions. Fishing Game: Create a fishing game using magnetic fish and a fishing pole. See who catches the most. Blow Darts: Blow darts is another traditional Hawaiian game. Blow up balloons and pin them to a fence. Throw darts and see who can pop the most balloons. Fire Dancer: Hire a fire dancer or a fire-breather. It will really impress your guests. 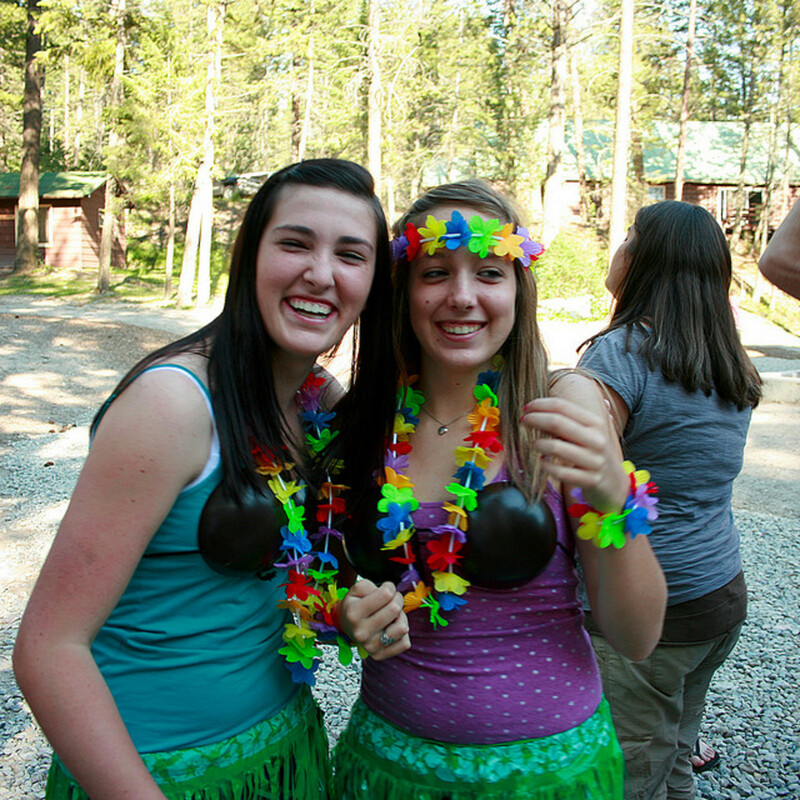 Learn to Hula: Teach your guests to hula dance. Learn a few basic moves and dance to the party soundtrack. Your guests will get a kick out of swaying their hips. No party is complete without rocking music to set the right atmosphere. Luau party playlists are easy to find, or you can just stream Hawaiian radio online. Try not to play too many unrecognizable songs, especially not back to back; that can get tiresome. Mix in a variety of upbeat music that would sound like something heard at a beach party. 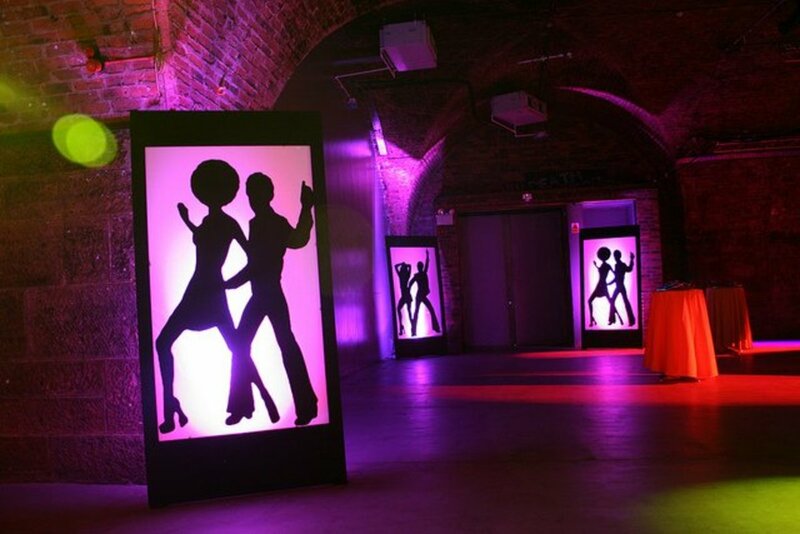 You want your guests entertained and dancing and having fun. Erupting volcanoes are fun to watch and more fun to make. 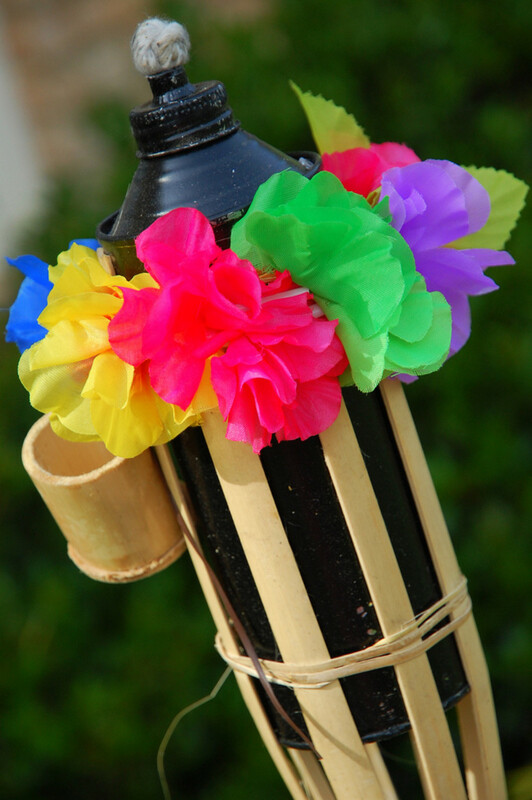 They are great for luaus and Hawaiian theme parties for decorations and to entertain guests. Create an active volcano for your next party. This is a guide to make an erupting volcano cake with smoke and flowing lava. It will look amazing and will really wow your guests. The steps are easy to follow and aren't hard. Drink ideas to make your party spectacular. Find out how to make glowing drinks, fogging drinks, flaming drinks, and Pop Rocks cocktails. Learn how to rim glasses and more. Hawai is a great theme for a party. prettynutjob30 - Thanks! Hope your volcano turns out smoking! These are some really cool ideas for a summer party, no better way to start the summer off than with a party. I will definitely be trying to make the volcano cake, such a neat idea. Great hub, voted up, more and shared. Hawaiian Scribe - Wow! That's a great compliment. Thanks so much! Glad it helped! Hope your luau is great! That sounds amazing! Thanks for your tips. Reading all that makes it seem like a lot of effort but so worth it! bella - That sounds like a cute outfit. Have fun! 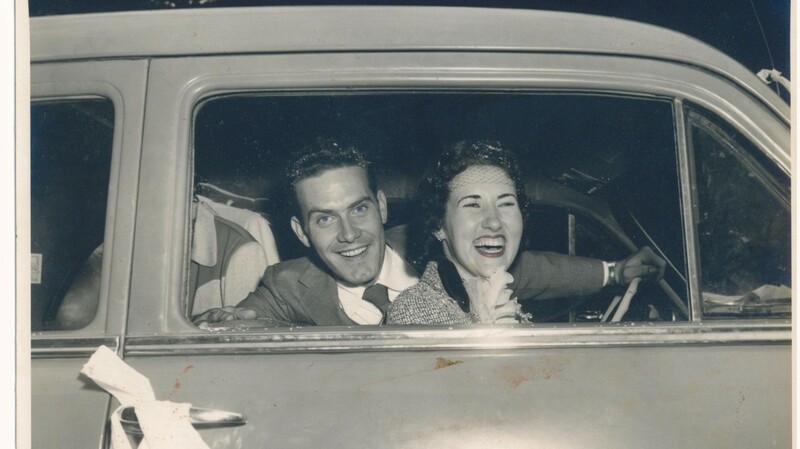 newusedcarssacram - It sure would! Thanks! Jackie - It sounds like your party is going to be awesome with all the stuff you have! I am having a sleepover b-day party soon, and it will be hawaiian themed! We lived in hawaii 2 months ago, so we like have a bajilion hawaiian stuff and snuff! Wow...I must say...if you make your arrangements in this manner then your party will be full of fun and excitement. 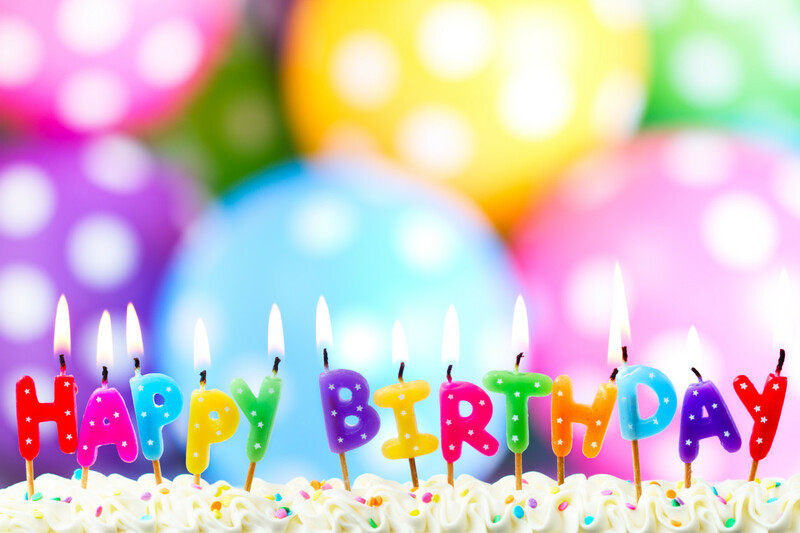 GIRL - Hope your party is amazing! Thanks! That buffet looks really good. It would be so much fun to throw such a party with an outdoor bar, food, and all the goodies. Loved your ideas..quite innovative.. Thanks..
Marcy Goodfleisch - I'm ready for a good luau, too! Thanks for sharing! I love these ideas! I'm ready - bring on the food and music! Voted up and pinned! ytsenoh - Luau parties are the best summertime parties. Thanks so much! Thumbs up. What a great job in presenting ideas for those who needs a lot of ideas for the Hawaiian themed party. Thank you. This is really awesome. Luau parties are really the best there is! Nare Anthony - Hawaiian stuff is awesome. I'll have to check out Jack Shimabukuro and add him to the list. Thanks so much! 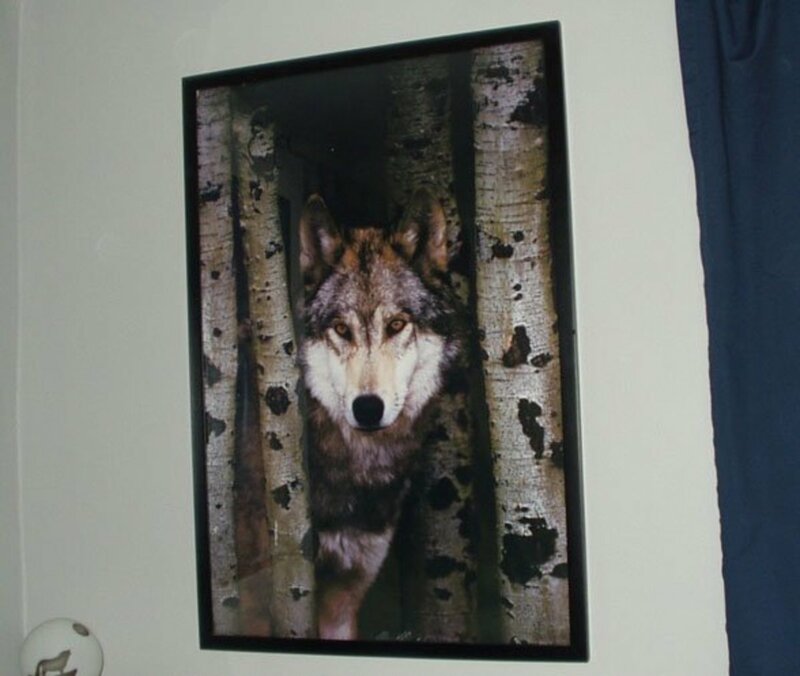 randomcreative - Thank you! Luaus can be a blast. writer20 - Getting motivated for a party shouldn't be too hard. :) Thanks! Turtlewoman - I love umbrellas and other foibles in drinks, too. They make it so fun. Thanks so much! Mmargie1966 - Thank you very much! Sounds like great fun. I'll try to get motivated. Voted up useful and interesting, Joyce. This is a great resource! I really want to do this sometime.